The Male Camlock Connector is designed to fit its female counterpart, the 3 inch BSPF Female Camlock. Camlocks function by use of two lever-clamps and a grooved counterpart. These fittings do not need to be unscrewed to separate, making attaching and detaching the two sections of 3” fittings fast and convenient. We recommend use of a camlock wherever 3" hose is in use, but a cam coupling is especially useful in drainage applications or wherever connection and disconnection of 3 inch components are a frequent occurrence. 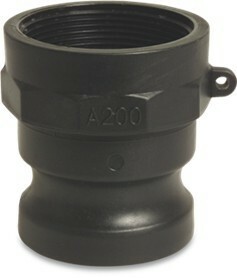 The camlock features a BSPF 3" thread for use with other 3" fittings. Camlock fittings are also known as cam couplings or groove couplings.